If your auto sales office needs an upgrade and you’re searching for NJ furniture for car dealerships, try the professional team at Bella Work + Space. At Bellia, we design and redesign office spaces for car dealerships throughout South Jersey. Whatever the size of your dealership, we have the experience and know-how to create a beautiful space that your employees and customers will love. 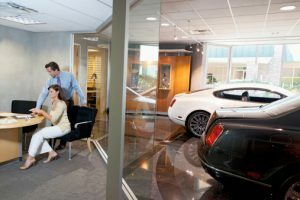 The appearance of a car dealership showroom is profoundly important. Your sales office especially should be inviting and should help foster a relationship between the salesman and prospect. And when an office needs a redesign, you should be able to carry on with your business while it’s happening. At Bellia, we work with you to keep your dealership going without a hitch as we redo your office…with beautiful, effectively arranged furniture that provides a long term return on investment. Bellia is more than a top quality furniture dealer. We believe in helping you achieve your office design goals, whether it be attracting new hires or creating a professional look for customers. We also communicate your brand’s identity and vision. Everything about our design process is about choosing the right furniture and arrangement to reflect your needs. We work with your team from start to finish…our Real Time Design ™ process enables you and your interior design team to view the project and comment or request changes from anywhere there is an Internet connection. Our process saves valuable time and reduces rework, and helps us to get the project done on time and on budget. We invite you to view some of our finished work and case studies on this website and see why Bellia should be your choice for NJ furniture for car dealerships. When you’re ready to beautify your dealership space, contact us today about a workspace evaluation. We’re here to help you love the space you’re in.